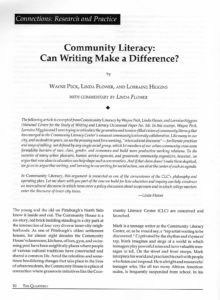 Community Literacy: Can Writing Make a Difference? Summary: This resource describes the process emerging from a Community Literacy Collaborative (CLC) initiative that enabled youth to use inquiry and writing to enter into a policy discussion about increases in school suspension and for their university mentors to enter into the discourse of urban teens. The approach is designed to promote intercultural discourse across race, class, gender, age, and economics barriers. Remarkably current (the school to prison pipeline comes to mind), this piece provides real world examples undergirded by a strong theoretical rationale and would be a useful resource for those framing community-based projects aimed at advocacy and civic engagement. Mark is a fifteen-year-old at a crossroads. He has important choices to make. He wants to be heard and taken seriously and to have a place to come to work on his dreams. The Community Literacy Center is an alternative forum for Mark’s art and argument and a place to begin a broader conversation about the issues he cares most about. In a recent CLC project, for example, Mark and ten other teens used writing to investigate the reasons for the increase in student suspensions in the public schools. To present this “policy paper,” Mark and his peers organized a “community conversation” with the mayor, the media, the school board president, principals, and community residents, in which Mark performed a rap written from a teen’s perspective and his peers interpreted it for the audience. As the culmination of their eight-week project, the teens also presented a newsletter, “Whassup with Suspension,” which has since become required reading for teachers and students in Mark’s high school.